Looks good! Much better effort than the new Bowden station. Are you kidding? Bowden looks amazing! Not saying it's bad, especially relative to other stations, but beyond the nice touch of red brick there's very little amenity for users particularly shelter. Melbourne can replace 700 m of concrete tram track in 6 days Sat 23 Feb 2019 to Thurs 28th Feb 2019. How long is it going to take Adelaide to replace the tram track from Victoria Sq to South Tce the same length ..6 weeks ... 6 months..... who knows??? it just shows what a bit of planning can archive. Weirdly enough one one of the poles looks like it's been completely rusted. Could this be from the sea breeze, this pole wasn't protected properly against rust but because the current path the line takes is going to be ripped up soon it's a waste of money to replace it? 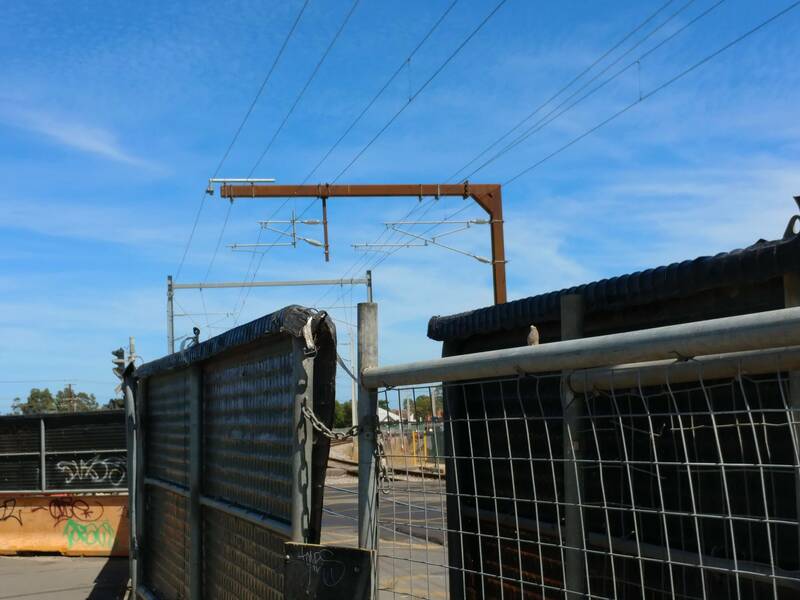 This pole was installed last year to replace a gantry structure immediately west of the level crossing to allow the trench excavation to proceed. One of the overhead gantries over the station also had the leg on the south side replaced. Since they were only temporary, plain steel was used rather than the galvanised treatment normally used. The overhead structures being installed on the new track are all galvanised. They are moving at lightening speed here since the weekend closure of the rail line. Old tracks running through the station had been removed by early Sunday afternoon. The overhead wires had been removed on Saturday night (hence the road closure). They have three weeks to get a lot done. I think the answer is no reuse. Two photos taken today of the canopy demolition. To have been reused the receiving station would have to have had side platforms at least as deep as the Oaklands platforms and with a platform rear vertical wall to which the canopy supports could be bolted. The third photo was taken in February showing the curved canopy supports attached to the back face of the platform. If that's true then that's poor planning. I'm sure it wouldn't be too hard to store them somewhere and there are stations along the Belair line with shelters made in the Middle Ages that could do with an upgrade. This whole upgrade is BS, it doesn't extend or upgrade PT at all, it's merely to satisfy motorists. The previous station was not even old and with some foresight, I agree with previous poster, they at least could reuse some materials for other station upgrades, but then that doesn't help our poor motorist does it? Bitter much you ask? Yes, I find it appalling in this time of undeniable climate change, that citizens and governments are still wedded to the idea of the personal motor vehicle. Rant over. True, but road infrastructure will remain vital even in a climate sensible future. Chokepoints affect buses and freight movement too, and the trains won't take people everywhere.